Federal investigators have confirmed the hot air balloon that crashed in Central Texas Saturday morning came into contact with high-tension power lines. Meanwhile, new information continues to be learned about the 16 passengers killed in the crash. They include newlyweds and a woman and her daughter on a deferred Mothers Day trip. The experienced pilot had a checkered history behind the wheel, but his balloon with a smile on the side reflected his personality, friends said. Whiel federal crash investigators haven't determined what caused the crash, they did reveal a memorial for the victims has been set up at the site "There’s some bales of hay with some flowers there, and it’s very moving," NTSB Board Member Robert Sumwalt said. Among the National Transportation Safety Board's early findings was that there were signs the balloon came into contact with power lines. However, investigators were not ready to say that was the cause of the tragedy. On Monday, Sumwalt said that utility crews and NTSB investigators inspected the power lines and found multiple points of contact, arching and abrasion along the wires. The NTSB said the examination of the balloon itself showed the top vent was open and the cables were pulled and stretched, which is consistent with a landing maneuver. Investigators used a helicopter to re-trace the balloon's route near Lockhart. The balloon crashed eight miles from its launch site. The NTSB said there did not appear to be anything out of the ordinary about the launch. Sumwalt said investigators have interviewed three members of the chase crew. He reported the team put up a trial balloon at a Walmart in San Marcos in order to determine the wind conditions on the morning of the crash. The team them moved to Fentress Airpark where they launched another test balloon to check the winds. During the drive between Walmart and Fentress, the ground crew reported patchy fog in low-lying areas and near bodies of water, but told the NTSB that at the time of launch the conditions were clear, Sumwalt said. During the flight, the pilot and ground crew used a navigation app where they could share messages. At 7:26 a.m., the ground crew received a position update from the pilot, but the ground crew could not locate the balloon and drove around for about an hour trying to call the pilot as well as passengers via phone numbers listed on a manifest, Sumwalt said. The remains of the balloon and gondola have been taken to a air salvage location in Dallas. 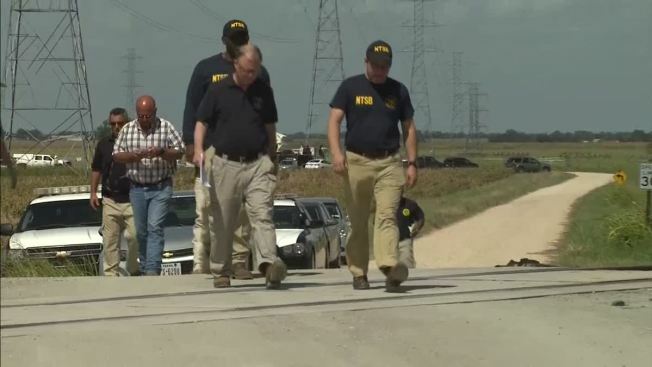 The NTSB, Federal Aviation Administration and Federal Bureau of Investigation expect to wrap up the investigation and leave the site by Wednesday but the investigation will continue in Washington. "Just because we’re leaving this scene does not mean in any way that our investigation is through," Sumwalt said. "This is the very beginning of a long and comprehensive investigation." Investigators said 14 cellphones, one iPad and three cameras were recovered from the scene. Most were badly damaged from the fire that broke out. All of the devices will be sent to the NTSB's lab in Washington for analysis. Dental records may need to be used to identify some of the victims, according to Caldwell County Judge Matt Kelly. Sumwalt asked anyone with video or photos of the incident send information to Witness@NTSB.gov; they could be useful to investigators. This is the third incident involving a Kubicek balloon, and one prior incident involved the same company, Sumwalt said. NTSB records show of 59 balloon accidents over the past five years. A hard landing on July 2, 2015, in Fort Carson, Colorado, was attributed to the pilot's improper burner control on a Kubicek balloon. Federal Aviation Administration records show a hard landing in a soccer field involving a Heart of Texas Kubicek balloon, but piloted by a different person and in a different balloon, Sumwalt said. Family members confirmed to NBC DFW that 34-year-olds Matt and Sunday Rowan, of San Antonio, died in the crash. They were newlyweds who left behind a 5-year-old son. On the morning of the crash, Sunday Rowan posted a picture to a social media site from Fentress, Texas, where the flight originated. In the photo, the couple is seen smiling ear-to-ear. Another photo was snapped high in the sky just 12 minutes before the balloon burst into flames. Also killed were Lorilee and Paige Brabson of San Antonio. Family members tell NBC affiliate KXAN-TV that Paige Brabson recently gave birth. The balloon ride was Paige's Mother's Day gift to Lorilee, her mother. Also killed in the crash were three friends from Katy: Joe and Tresa Owens and their friend Holly Smith Huckabee, according to Ashley Burges. Burges said the hot air balloon ride was a birthday president for her mom Tresa Owens, 53, from Joe Owens, 43, and Huckabee, 50, who was her best friend. Burges said the balloon ride was originally scheduled for May but was rescheduled because of weather. "The hot air balloon was something Tresa always wanted to do. Joe didn't want to as much, but he did it for Tresa. He would do anything for Tresa," Burges said. "We are at peace knowing that they were having the time of their lives and enjoying themselves." Scott Douglas, was also identified by the Justice of the Peace in Lockhart as one of the victims. He's the only victim to be officially identified via dental records. No date of birth was given, his family has been notified. John and Stacee Gore, of Mineral Wells, were also killed according to the couple's pastor. The couple was celebrating their third wedding anniversary. The pilot, 49-year-old Alfred "Skip" Nichols, also died. Friends said he had decades of experience flying hot air balloons. Neighbors left flowers at Nichols' home in the city of Kyle. They remembered Nichols' personality and the hot air balloon with a smile on the side. "It [the balloon] had a happy face on it," said neighbor Alix Ramczyk. "It really made you smile and that was just the kind of guy that he was." An Associated Press report on Nichols said he previously operated a balloon touring company in Missouri and that the company had an "unsatisfactory" record for not responding to complaints and had a history of driving while intoxicated, though his girlfriend said he was four years sober. Nichols' friend and roommate, Alan Lirette, said he wanted everyone to know Nichols was a great pilot.